SPOKANE – Three of the female residents at the Department of Corrections' Eleanor Chase House Work Release graduated from a program aimed at preparing people to apply for construction trades apprenticeships. Sarah Lynn Hall, 24, Kelly Gonyon, 31, and Janett Mayberry, 37, graduated from the Skilled Trades Preparation Program run through Spokane Community College. 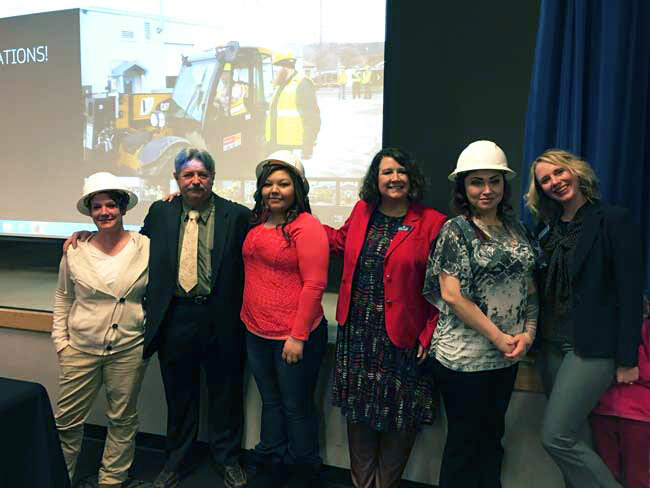 Spokane area apprenticeship coordinators assisted the college in curriculum development. The 11-week course includes topics such as applied math, blueprint reading, tool and material identification, and hand and power tool identification. Participants receive training in first aid, financial literacy, flagging and forklift driving, and Occupational Safety & Health Administration (OSHA) construction safety. "These ladies have worked very hard for the past 11 weeks attending the Skilled Trades Preparation Program at Spokane Community College," said Michele Mans, a community corrections officer with the Eleanor Chase House Work Release. "This is a great accomplishment for each of them. They now have a skill set they can use to earn a great wage as they transition to the community from incarceration." Participants learn skills to improve their writing and reading comprehension. The course also teaches students in the program "soft skills" they can use in real-life workplace scenarios. These skills include problem-solving, effective communication, and workplace etiquette. All participants received a pair of custom fitted work boots and a hard hat after completion of the program. The boots and hard hat were funded by the Pre-Apprenticeship and Supportive Services (PASS) Grant, offered through the Washington State Department of Transportation. The PASS Grant provides funding for specific supportive services and pre-apprenticeship training for women, minorities, and socially and economically disadvantaged individuals, according to the application website. Corrections officials at the Eleanor Chase House say the women who graduated the pre-apprenticeship programs are eager to start their apprenticeships. Hall was recently accepted into the ADG carpenter's apprenticeship. She also received a grant from Next Generation Zone, a career center for young adults spearheaded through the Spokane Area Workforce Development Council to purchase a set of tools and clothing. Gonyon will be starting an apprenticeship with the Heat and Frost Insulator's Union this fall. Mayberry has plans to pursue an apprenticeship in aerospace engineering in Walla Walla County. Work release facilities serve as a bridge between prison life and life in the community. Incarcerated people at work release facilities focus on transition, including finding and retaining employment, treatment, reconnecting with family members, developing life skills and becoming productive members of society. The Eleanor Chase House Work Release, located in Spokane, houses only female inmates. It has several rehabilitative programs that offer assistance with issues such as child visitation, education and GED® completion, employment and substance abuse treatment.